In this review we’re looking at the Draper 13785 Vacuum Cleaner. It’s an industrial type cleaner which is also for use around the home. You may think that using something made for industrial use around the home is a bit like using a sledgehammer to crack a nut, but is this the case? Surely the more heavy duty the better? Or might it be a case of spending more than is necessary? We’ll take a look at some of the features to see how it performs, plus some of the good and not so good things about it based on customer feedback. NB: If you’ve already decided and want to buy the Draper 13785, make sure you check it out at Amazon.co.uk, CLICK HERE. Drapers Tools is a family run business which has been around for many years. The company began trading in 1919, working to very high standards which it still employs today. They’ve sold their own brand of different types of tools from the very start and have always made sure high quality is utmost. Vacuum cleaners are just one of the many tools they sell and they are well respected in this field. This is a well-made machine and is easy to use out of the box. You just need to push the four castor wheels into place, attach the cloth filter and the paper dust bag if you intend to use it. You have the option with the paper dust bag as the cleaner works with or without it. It isn’t a replacement for the cloth filter, which has to be used either way. The benefit of fitting the paper dust bag is that it makes it easier to clean after use, plus it’s more hygienic and it prolongs the life of the cloth filter considerably. If you do use it without the dust bag you can always wash the filter as long as it’s dry before reusing it. Because this cleaner has been designed for industrial use it’s able to stand up to tougher jobs. This might not be needed for everyday use, but will come in handy if needed for heavier jobs. The tank size of 20L is also good for handling bigger clean ups. Although the Draper 13785 Vacuum Cleaner is very handy and powerful to clean around the home with its 1250 watt motor, it’s also designed for use in workshops, garages or similar workplaces. It comes in very useful if you’re doing some home DIY as it is able to clear up a lot of the mess. It’s very simple to switch from dry to wet cleaning. You need to empty the tank and replace the cartridge filter with the anti-foam filter and that’s about it. Remember to swap the filters back again before you do any dry cleaning otherwise you could damage the motor. There are a lot of wet and dry vacuum cleaners on the market which do a very good job. One of the advantages of this one is that it is made by a family run British firm which has a good reputation and has maintained exceptionally high standards since it started back in 1919. Considering this cleaner is robust with a good vacuum pressure of 13Kpa, it’s relatively lightweight at only 4.5kg so is easy to handle. This is really good for a cleaner designed for industrial uses. It’s not necessarily the best canister vacuum cleaner there is, but you’d have to go a long way to beat it. 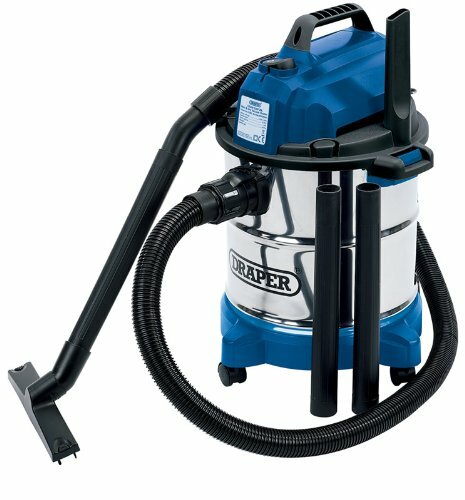 The Draper 13785 Vacuum Cleaner isn’t at all expensive and has multi-uses around the home or in the workplace. It requires very little maintenance other than regular cleaning and making sure the motor is ventilated.